Let me say this from the start: I am not an SEO guy. Don’t ask me what the keywords are for my site. I have no idea what they are. And don’t hire me to “optimize” your site. I honestly don’t even know what that means. Sometimes I wonder if SEO guys even know what that means. How about Facebook Timeline Cover Photo Rules for fun? I’m not trying to brag (okay, just a little), but to prove a point… Okay, screw it, let’s brag. 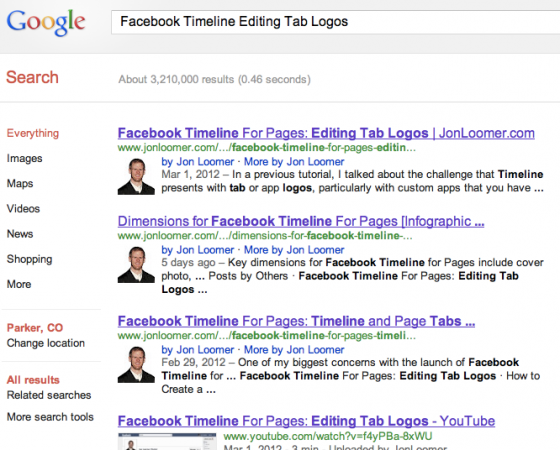 How about Facebook Timeline Editing Page Tab Logos for the win? That’s the top four, my friend. Couldn’t even fit the entire result for my video in the screen shot. When it comes to titles and content, my only strategy is to create value. Not find a term that has low, medium or high competition. I know, that’s nuts. I came into this six months ago knowing close to nothing about SEO. I know more now. And I practice some of the important strategies to get my blog seen like sharing on social media, building a lot of content and commenting on other blog posts. And you’ll notice that I implemented the rel=”auth” code so that my mug shows up as the author in all of those posts. That’s nice. But I don’t use the Google Keyword Tool to help me think up new topics to cover. I’ve tried it, don’t get me wrong. But the results are never relevant for me. My SEO keyword tool is in my head. The third is the content of others. But there are two very important keys to writing “great content” that I don’t believe a keyword tool can help you with. I keep a running list of blog post ideas as I think of them. But social media — especially the Facebook world, which changes so quickly — is fluid. You have to be reactive. An example is the launch of Facebook Timeline for Pages. This was launched on February 29. I immediately got to work. Within eight days, I had written and recorded 12 tutorials. I didn’t establish two weeks before that what tutorials I was going to write. I was prepared for that Wednesday launch. And when it happened, I quickly dug in and figured out what types of posts would be helpful. It was entirely reactive. You have to be prepared to react and provide the content that you know people will need before they know that they need it. If you’re first, others will react — and often link — to you. Think to yourself, What questions will people be typing into Google about this? That should be the focus of your title and your content. There are some exceptions (I guess this post is one of them). But you always want to try and answer a question. I guess you could use a keyword tool to get that information, but I think you’re often better off using your own brain, particularly when it’s about a very new topic. It’s also more natural. Organic. And if you are an expert in your field, you should be tapped into what people want. Writing a good blog post doesn’t mean covering the hottest topic about Facebook, Social Media or Blogging. To me, a good blog post has to answer a question. Not worrying about low, medium or high competition. Not looking for the “long-tail” keyword. Look to add value first. This isn’t meant to take anything away from what SEO folks do. I’m sure I could learn plenty from them. But SEO can get you too wrapped up in numbers and things that don’t matter. If you focus on value, being first and answering the questions of your readers, you’ll be fine. How do you choose your topics? Do you use keyword tools or pick them more organically?